The dialysis procedure for cases of limited renal function has been generally recognized for quite some time and is applied successfully. A comparable, standardized method of treatment for patients with liver disease does not exist yet. The Munich-based company Hepa Wash is currently working on changing this situation and is now, thanks to years of research and development, in the market introduction phase for a new liver dialysis device that also has the potential to support multiple organs. Back in the mid-1990s, Dr. Bernhard Kreymann invented Single Pass Albumin Dialysis (SPAD for short). At that point in time, the future founder of Hepa Wash was working as a physician in the intensive care unit of the Munich university hospital, Klinikum rechts der Isar. It was already clear back then that the high financial costs and methodology of SPAD could not be a satisfactory long-term solution. One day, while on vacation, the liver specialist started thinking about how to develop or even revolutionize the SPAD method to make it more effective and less expensive, based on his knowledge of chemistry from school and university. This thought process quickly turned into concrete research, and led Dr. Kreymann to found Hepa Wash in 2005 as a one-man startup. The first Hepa Wash research laboratory was located in Garching near Munich. The project was predominantly funded by private investors and the KfW Bankengruppe. How does the new liver dialysis method work? Hepa Wash has developed a certified method aimed at helping patients with an existing liver disease to support and thus unburden the liver over a certain period of time. This is particularly important in acute cases, such as an infection. 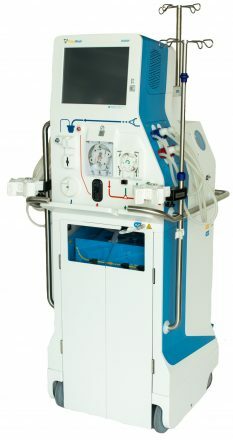 With Hepa Wash® technology, a patient is connected to the LK2001 liver support device. The contaminated blood is passed through a semipermeable membrane. On the other side of the membrane, a cleansing fluid (dialysate) circulates that is enriched with human serum albumin. This allows water-soluble and protein-bound toxins to pass through the membrane into the cleansing fluid, where they can be removed. This kind of semipermeable membrane is necessary so that only the toxins are removed if possible, while leaving the substances necessary for the body in the blood. The toxin-laden dialysate is then recirculated in a second circuit during which the pH and temperature are modified to isolate and discard the toxins (Hepa Wash® circuit). The purified dialysate then flows past the blood a second time to remove additional unwanted substances. This keeps the amount of albumin needed for the cleansing solution as low as possible – a crucial difference compared to the SPAD method. Liver dialysis prevents toxins from spreading in the body, which in turn prevents the possible threat of multiple organ failure. To create this method, scores of tests were necessary over a timeframe of many years to optimize system parameters such as flow rate, temperature and the composition of the cleansing solution. Being in close proximity to Munich’s universities has been of vital importance for Hepa Wash. The company has been able to consistently employ motivated and creative students who actively collaborate in research and development. It’s a textbook example of a win-win situation: The students learn an amazing amount through their work, while the company simultaneously benefits from the relatively cost-effective staff, who then also have a real chance of becoming a permanent employee after completing their studies. Most of the 30 employees who make up the current workforce are former students who remained with the company after completing their degrees. 20 to 30 students currently participate in the project each semester. The company has been located in the Munich Technology Centre (MTZ) since 2008 and has continued to grow steadily since then. Further production areas and offices have been rented over the years as well. Moreover, the multinational team is in a continuous state of growth. At the moment, Hepa Wash is collaborating with selected clinics and physicians in Germany to implement the method in clinical practice, to further optimize it and advance its market launch. All the while, further research and development efforts are being invested in the field of multi-organ support. We wish Hepa Wash continued success and all the best for their market launch!